As the world changes with demanding and critical issues on the horizon, physicists, with their cross-disciplinary transferable skills, their broad scientific training, coupled with their ability to deep-dive into problems requiring mathematical and computational rigor, make them high-value assets in the global job market. FACT: Most physicists do not remain in academia. The vast majority of graduates trained in physics decide to pursue commercial and institutional jobs, working in every field imaginable from banking and finance to computing, data analysis, medicine and industrial/engineering physics, and science writing. Some are entrepreneurs who go on to start their own companies. Statistically speaking, you are likely to wind up in a non-academic career. If you haven’t thought about that, there is no time like the present. This year, the CAP Congress will help you to start thinking about career paths for physicists. A three-hour workshop to help you build your network and networking skills, run by MITACS, will be held on the Sunday (June 10) from 1:30-4:30 pm. Anyone registering for this Workshop will be required to complete a 90 minute, online pre-workshop activity, approximately 1 week prior to the Congress. The workshop will then take your initial online learning to the in-person, interactive learning environment on June 10th. NOTE: This workshop is open to CAP Graduate Student Members and Undergraduate Affiliates only and will have limited availability, so register early to guarantee a spot. During the congress week, all delegates (members and non-members) are invited to join us for an informative lunch-and-learn seminar (Non-Academic Physics Careers) on Tuesday to chat with industrial representatives at an informal Industry meet and greet on Tuesday evening, and then to attend a lunch-time industry panel session (Physicists in Industry) on Wednesday. Sign up for all or some of these events as you complete your Congress registration. See the Congress update below for information about registration and membership. The Communications Committee has expanded, and is working on some exciting projects to help us better meet the needs of the organization and improve communication with our members. We are currently testing a new customer relationship management (CRM) system which is on track to launch this fall. Among other things, the new CRM will simplify the membership application and renewal process, improve the Congress registration process, give the CAP Divisions direct access to communicate with their members, and provide new efficiencies to help us grow CAP membership. The CAP staff now includes a Communications Manager, Melissa Raftis, who is working fulltime to implement the committee’s objectives including making improvements to the CAP’s website, growing our social media reach and working with our partners to raise awareness of physics among educators and potential future physicists. The Communications Committee meets regularly to ensure we are supporting the CAP’s strategic objectives. We encourage you to follow the CAP on Twitter, Facebook and LinkedIn to help us promote the great things happening in Canadian physics! The CAP Communications Committee consists of Committee Chair Marcello Pavan (TRIUMF), Francine Ford (CAP), Colin Hunter (Perimeter Institute), Samantha Kuula (SNOLAB), Martin Laforest (IQC, University of Waterloo), Melissa Raftis (CAP) and Sandra Ribeiro (Canadian Light Source). CAP members can bring up any questions or concerns by contacting Marcello Pavan at marcello@triumf.ca or Melissa Raftis at comms@cap.ca. 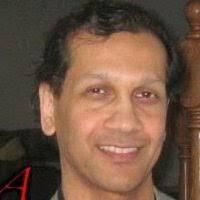 The Division of Physics in Medicine and Biology (DPMB) is a core constituent of the Canadian Association of Physicists. With over 245 members, the DPMB contributes significantly to advancing biological and medical physics in Canada. We also coordinate with other societies such as the Canadian Organization of Medical Physicists (COMP), Biophysical Society of Canada (BSC), and Soft Matter Canada. Key activities of the DPMB include membership in the CAP Council, developing the scientific program in medical physics and biological physics at the annual CAP Congress, and conducting a student competition (with cash prizes). We’ve received a record number of submitted abstracts for the 2018 CAP Congress. With over 16 invited speakers, 13 dedicated sessions including two joint thematic sessions (translational research in medical physics and soft matter, and molecular dynamics) and medical physicist and researcher Professor Anne Martel delivering a plenary talk, the 2018 Congress is promising to be an exciting event for the DPMB. Furthermore, starting in 2018, we will be pioneering a new session called “DPMB 101”, which strives to make the topics of medical and biological physics more accessible to the larger community. We hope to see you in Halifax this June! 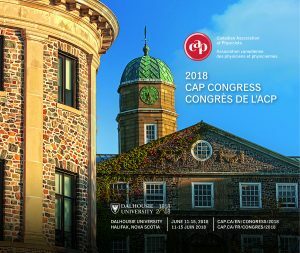 CAP invites you to register for the 2018 CAP Congress at Dalhousie University in Halifax, Nova Scotia on June 10-15. There are significant savings for CAP members and delegates who register before midnight EST May 7th. You must have a valid CAP membership at the time of registering for Congress in order to qualify for CAP Member and Affiliate rates, and to compete in the Best Student Presentation Competition. 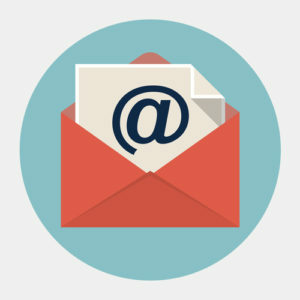 Please note: new and renewing membership applications must be received by the CAP Office no later than midnight EST Sunday, April 29th to ensure they are processed in time to benefit from early registration rates for members. Information about discounted accommodations, local eateries, Halifax tourist highlights and more can be found on the 2018 CAP Congress website. A full listing of programming, events and other information will be posted on the 2018 Congress website when it is available. Bookmark this page and check back regularly for updates. We look forward to seeing you in Halifax this June! The CAP is happy to announce we’re official partners of Canada’s first annual International Day of Light celebrations. Throughout the world, individuals and organizations will be hosting events and activities on or around May 16th to celebrate the indispensable role that light plays in science, technology, art, environment and culture. We invite you to host a light-related event/activity either as a stand-alone event, or in conjunction with our partner events such as Science Odyssey, Science Rendezvous, and SciPop. Some examples include demos such as a laser maze, light painting show, or a public lecture on a “light” topic. We also invite you to share your news/research stories with us via idl.cap.ca. 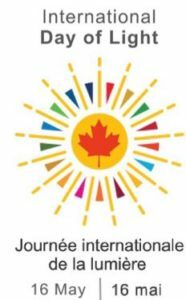 We will be glad to help promote your event/stories via the IDL-Canada website (idl.cap.ca), and social media (facebook.com/IDLCanada, www.twitter.com/IDLCanada). Use the IDL-Canada logo at your event, and in your event promotion. Tag your social media posts with #IDLCanada18. Let us make this a grand celebration of light! The 54th Annual Canadian Undergraduate Physics Conference (CUPC) will be hosted by students at the University of Alberta. The conference will be held from August 15th to 18th, 2018. The CUPC is organized entirely by students. It is the largest undergraduate physics conference in North America with approximately 250 expected participants. 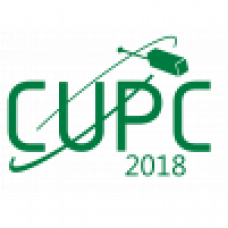 The CUPC showcases the exciting undergraduate research carried out by students across Canada, aiming to inspire young physicists by celebrating their achievements as they begin their journey as research scientists. Registration is now open! We would like to invite all undergraduate students in physics or physics-related fields to participate in this amazing conference. Share your research, network with peers and faculty, attend lectures given by prominent speakers, and tour the state-of-art facilities of the University of Alberta. Whether you are interested in presenting a poster, providing a short slideshow presentation, or just want to soak in all the great work being done by students just like you, CUPC is the place to be. CUPC 2018 will also include a Graduate Studies and Industry Fair! We would like to invite graduate students and faculty from across the country to host a table and share with attendees the benefits of further education. We would also like to invite industry representatives to host a table and connect with undergraduate physics students looking for career paths available to them. Undergraduate students, do not worry about having a complete abstract together when you register: abstracts will be open to editing until August 1st! Additionally, we recognize that research may not be complete by August 1st and understand that your final presentations and posters may be slightly different from the abstract you provided. We look forward to seeing you in Edmonton August 15-18. For more information and to register, visit cupc.ca. If you have any questions, email us at cupc2018@ualberta.ca. PLASMIONIQUE Celebrates its 19th year in the business of design and development of Advanced Surface Engineering tools, using plasma-based technology. April 2018 also marks the 5th anniversary of introducing its Compact and Table-Top Series, Thin film processing tools, which have been installed in several research laboratories in Canada, USA, Europe, Australia and New Zealand. These compact computer controlled systems have features similar to large Plasma Processing systems, including advance diagnostics, data acquisition and remote interface capabilities for technical support, making them ideal for research and training, at reasonable cost. Processes offered include, Organic and Inorganic Thermal Evaporation, Sputter Deposition, PECVD, RIE, as well as hybrid systems. The Compact Series could also be integrated into a glovebox. Contact us at Info@plasmionique.com for more information. PLASMIONIQUE installed its new Roll-to-Roll hybrid ATMOS series system in Professor Stafford’s laboratory at the University of Montreal’s Physics department. With PLASMIONIQUE’s FLOCON Series, Gas, Vapour and Liquid flow management system is integrated with the system. The newly designed system could treat surfaces of metallic, polymeric, paper or textile webs using atmospheric Dielectric Barrier Discharge (DBD) plasma, or low pressure plasma. Provisions are also included in the system to allow deposition on solid surfaces as well, using a motion controlled heated substrate holder that is integrated in the same system, offering increased flexibility and optimum functionality. Contact us at Info@plasmionique.com for more information. The 14th International Conference on X-ray Microscopy (XRM2018) will be held in Saskatoon, Sask., from Aug. 1 to 24. The meeting is hosted by the Canadian Light Source and the University of Saskatchewan. XRM2018 will bring together experts in the development and use of X-ray microscopes and will address the most recent advances in X-ray microscopy technology and applications through a program of talks, posters, and social interaction. Attendees will be offered the chance to tour the Canadian Light Source, located on the University of Saskatchewan campus. XRM2018 is the fourteenth international conference in a series that started in Göttingen, Germany in 1983. 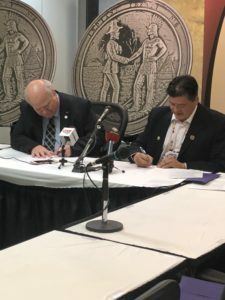 CLS science director Dean Chapman and FSIN Chief Bobby Cameron sign a memorandum of understanding to support science education at First Nations schools. The Federation of Sovereign Indigenous Nations and the Canadian Light Source have renewed their commitment to work toward supporting science education at First Nations schools. On March 19, FSIN Chief Bobby Cameron and CLS science director Dean Chapman signed a memorandum of understand to extend their partnership for another five years. The two organizations signed their first MOU in 2016. “We know kids benefit from early exposure to science. To be able to coordinate our efforts with the FSIN to reach even more youth is a fantastic opportunity,” says Chapman. Science and art collided on Wednesday March 21stas over 100 works of art were curated and assembled in Laurentian University’s Atrium for the 5thAnnual SciArt Exhibitio. The aretwok was diverse and contributions came from elementary and high school students, LU faculty members, staff and students, along with members of the community. A panel of scientists and artists selected entries that were deemed most innovative in their fusion of the art and science. Dr. Erica Caden, SNOLAB Research Scientist, was awarded the LUFaculty Best in Show for the presentation of an intricate textile piece depicting a neutrino event display. Blaire Flynn, SNOLAB Education and Outreach Coordinator, was awarded the LU Staff Best in Show prize for a collaborative art piece exploring the idea and nature of dark matter. 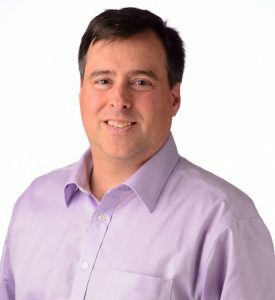 Read the full story on the SNOLAB website.